I had a brainwave the other day. Why do I cook a whole roast chicken if we only ever eat half? I realise that for most normal people, this is just a regular thought process, but it really was a lightbulb moment, at least in my head. With only two of us at home, the leftover chicken invariably ends up in the bin. My partner stubbornly refuses to eat chicken thigh and I what not fond of leftovers (cooked meat, especially without a sauce, has an unappealing aftertaste to me). Cue brainwave – if I only roast the crown, it will only take half the time and I can use the leftover chicken marylands in something else. Not only does it take half the time, but roasting a chicken crown means that you can chuck all the vegetables in the oven at the same time, go and do whatever it is that needs doing, and have dinner on the table in an hour. Roast doesn’t have to be reserved for Sunday dinner anymore. Cooking the breast on the bone adds extra flavour and allows a higher margin of error i.e. the breast is more likely to stay tender and moist than if you were cooking it off the bone. 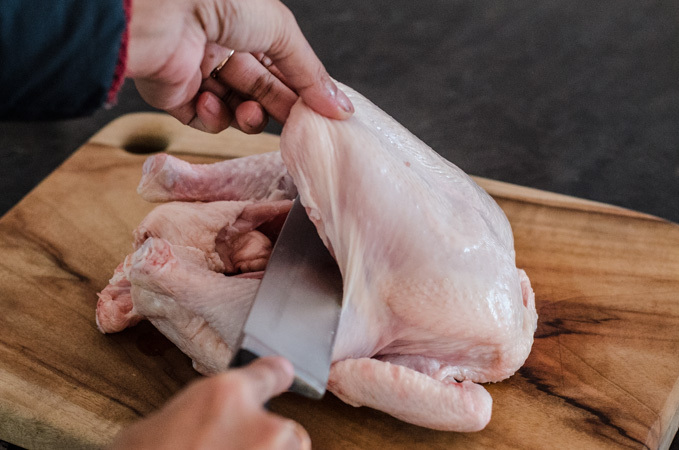 If you’ve never made a roast before, this is the easiest way to start – there’s no need to worry about timing different vegetables or flipping the bird (ha, I couldn’t resist) or stress about the breast drying out because the thigh isn’t cooked yet. Best of all the skin on the chicken breast always comes out golden brown because it doesn’t get soggy from being squished underneath. That’s so many wins that I can’t believe I didn’t think of this earlier. If you prefer roast chicken thighs, the concept is the same. 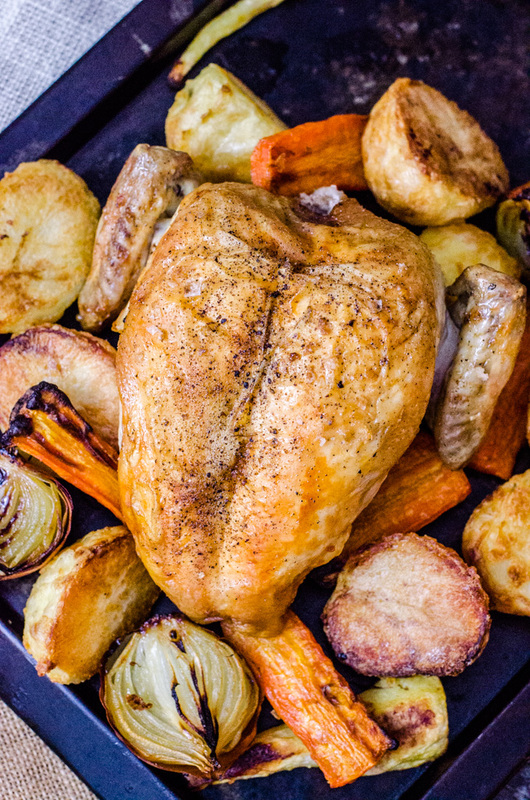 Where a whole chicken takes about an hour and twenty minutes to cook, cooking just the crown (or thighs) takes about forty minutes – which is the perfect amount of time to roast vegetables. Just cut along the dotted line, as pictured, through to the bone on the back. You can decide to leave the wings on or not – I love a roast chicken wing, so I’ve left them on. This is more of a guide than a recipe, but I hope that you will find it easier to follow. Preheat oven to 200C, with your roasting tray inside – this means that the potatoes will start to brown as soon as they hit the hot tray. For crispy potatoes: Peel potatoes and cut into half (or even sized pieces). Boil in salted water for 10 minutes, until the outsides are just fluffy. Drain in a colander. Heat butter or duck fat in the same pan, add potatoes then cover with a lid and shake until the outsides are bruised. This gives the best delicious crispy brown exterior. You can also just peel and chuck potatoes onto the preheated pan without parboiling. Add other vegetables as desired – I used halved carrots, parsnips and brown onions. Large chunks of cauliflower florets are always great too. Add a dash of olive oil and sprinkle with sea salt. Season the chicken breast with a bit of olive oil, sea salt and pepper and place on a separate tray – the water from the chicken can make the roast vegetables soggy. Place on the rack above the vegetables so that the skin has the maximum chance to crisp up. Cook for 40 minutes. Remove from the oven and set aside to rest for 10 minutes. Move the vegetables up a rack in the oven if they need more browning. Tash, Brilliant and practical. I have been struggling with the same issue. Thank you for posting the idea. More recipes for two, please. Glad you like it – in hindsight, I wonder what took me so long for it to dawn on me. I guess we cook out of habit a lot sometimes.